Speyer is located along the banks of the Rhine river in the southwest of Germany, in the Rhineland-Palatinate state. Speyer is a one hour drive south of Frankfurt. The 11th century Imperial Cathedral of Speyer is one of Germany's largest and most important. Its crypt contains the tombs of eight German emperors and kings as well as several bishops. Modern heads of state are often brought to the cathedral as a symbol of Germany's past. Speyer was also a center for Jewish scholarship in the medieval period. The ritual bath, "mikew," is one of the most complete in Europe. The Speyer Technik Museum has a large collection of airplanes, classic cars, locomotives, fire engines, a German U9 submarine and a Russian An-22 transport plane you can not only see from the outside but you can enter and poke around in. There is an on-site hotel and Caravan camping is available. Speyer's rail station is located to the northwest of the old town, a 10-15 minute walk to the center. Speyer Tourist Bureau The tourist office is located on Speyer's main pedestrian street, the Maximilianstrabe. The telephone number is 0 62 32-14 23 92. To fully understand the symbolism in the cathedral, be sure to pick up a copy of the free brochure "The Imperial Cathedral of Speyer." 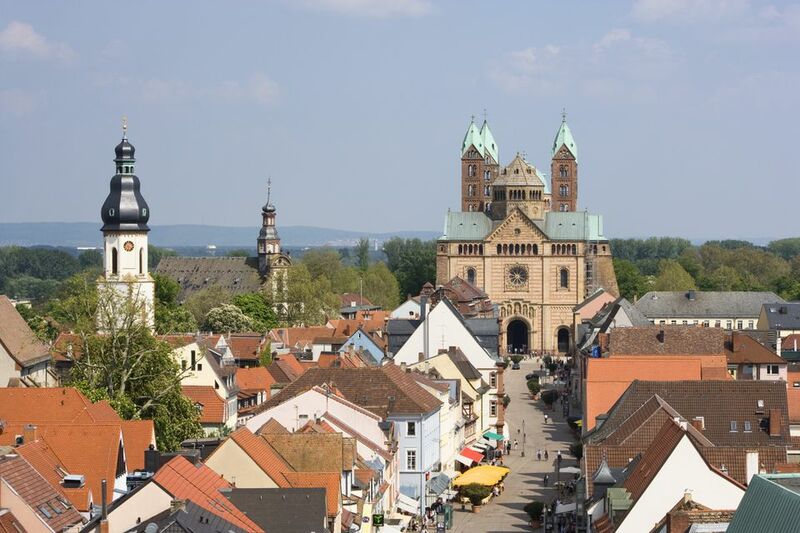 Speyer is about 3 1/2 hours from Munich by train and a little over two hours from Cologne. To the west of Speyer is the town of Neustadt and the southern wine road, accessed via route B39. Neustadt itself has a bit more charm than Speyer and is worth half a day to poke around. South of Neustadt are small wine towns like St. Martin and Edenkoben, villages loaded with both charm and wine tasting venues. Many of the same wine varietals as are found in the Alsace region of France to the south are found here, at a fraction of the price. To the west of this wine region is the Naturpark Pfalzerwald, a wooded area studded with hiking trails. Karlsruhe, gateway to the Black Forest and a popular stop for Rhine river cruises, is just to the south. The crowd source favorite place to stay is the Hotel Am Wartturm. It has a restaurant and free wifi. Besides the cathedral, Jewish ritual bath and synagogue ruins, and the Technik museum, the visitor will want to see many of the smaller churches, the baroque town hall (Rathous), the Historic Museum of the Palatinate (Historisches Museum der Pfalz), the aquarium, the archaeological showcase, and the memorial for Sophie la Roche, the publisher of the first ladies' magazine. The Main city gate (13th century) can be climbed for a view of old town Speyer and the cathedral; it's one of the tallest in Germany.